Happy National Weed Appreciation Day! It really boils down to this: that all life is interrelated. We are all caught in an inescapable network of mutuality, tied into a single garment of destiny. Whatever affects one destiny, affects all indirectly. – Dr. Martin Luther King, Jr.
You can’t help but admire a plant that has adapted to lawn mowers. But beyond their value as a philosophical aid, can weeds be beneficial? In fact, what weeds you find can tell you something about the soil. Is it wet or dry? Lean or fertile? Compacted? Acidic, alkaline, or neutral? Check out the short overview from the University of Vermont, What Weeds Can Tell You. Then act accordingly. Often, weeds we find troublesome are plants we once valued. Dandelions, garlic mustard, plantain, and burdock are examples of plants brought over and cultivated by settlers to North America for food and medicine. And there are efforts to regain that value. One doesn’t need to spend too much time on the internet to find many resources on edible weeds. Take a look at this short video, Edible Weeds | From the Ground Up, developed by the University of Wyoming Extension (which includes some precautions you should take if you want to try eating your problems away). The Northeast Sustainable Agriculture Research and Education recently funded a project looking at bringing edible weeds from the farm to the market. These trichogramma wasp parasitized European corn borer eggs aren’t going to hatch. There is research looking at the ecosystem services provided by weeds in agricultural settings. In their project, Integrating Insect, Resistance, and Floral Resource Management in Weed Control Decision-Making, Cornell researchers make the argument that while weeds can compete with crops, they can also benefit the entire system. They use milkweed along a field of corn as a case study. 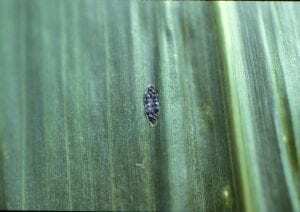 There are aphids that feed on the milkweed and produce honeydew, which benefits beneficial insects such as wasps that lay their eggs in the eggs of insect pests such as European corn borer. And that’s before they discuss the benefit to monarch butterflies. Early flowering weeds, such as this purple deadnettle, provide an early spring food source for pollinators. 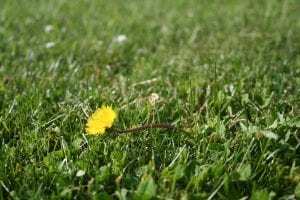 And speaking of butterflies… and bees… and other pollinators, in the write-up of a study looking at the capacity of untreated home lawns to provide pollination opportunities, they reclassified weeds as “spontaneous lawn flowers”. So much friendlier! By the way, they found 63 plant species in those lawns. 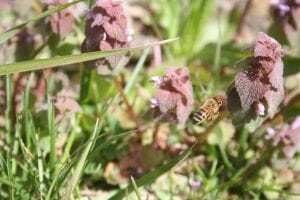 In a parallel study looking at mowing and pollinators, they found that lazy lawn mowing led to more spontaneous lawn flowers leading to more pollinators. So now I have also given you an excuse to mow less. You’re welcome. So embrace your spontaneous flowers! If, after today, you still want to manage those plants, you can always find a plethora of resources for different settings within our New York State Integrated Pest Management website.